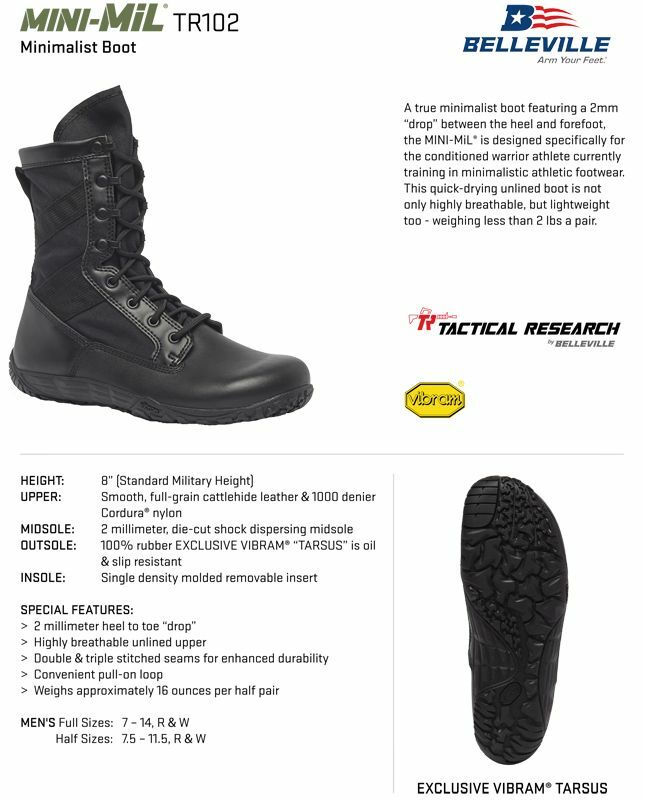 The Tactical Research TR102 MiniMil Ultra Light Black Boot is the first minimalist boot to be released on the military boot market. Based on the same tenets of the VIBRAM Five Fingers shoe, the MiniMil features a 5mm heel drop and a thin midsole to allow you feel the terrain you're walking on. As a training boot, the MiniMil will modify way you walk by training your feet to land flat footed on the ground instead of heel first like traditional footwear. This boot features a hot weather design with an unlined leather and nylon upper. As a minimalist boot, it still provides adequate protection from the elements with a padded achilles heel support and abrasion resistant nylon Cordura and leather. The TR102 is the ultimate lightweight training boot and is also ideal for light duty or garrison.